Recently, evolutionary computation has become an active research area. Multi-modal optimization is one of the most important directions in this area. The target of multi-modal optimization is to locate multiple peaks in one single run. Particle swarm is one of the most effective global optimization methods. However, most of the existing PSO-based algorithms suffer from the problems of low accuracy and requirement of prior knowledge of some niching parameters. 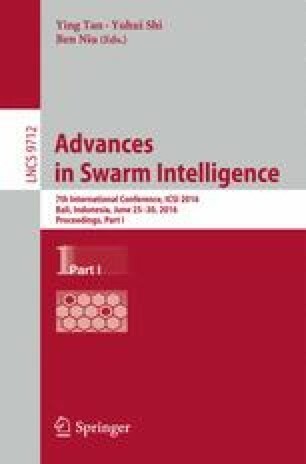 To tackle these issues, this paper proposed a Novel Local Particle Swarm Optimizer to solve multi-modal optimization problems. To enhance the algorithm’s ability of locating multiple peaks, a new local best based velocity updating formula is introduced. With the proposed updating formula, the probability of finding global/local optima is greatly increased. The experimental results reveal that the proposed algorithm is able to generate satisfactory performance over a number of existing state-of-the-art multimodal algorithms. This research is partially supported by National Natural Science Foundation of China (61305080, 61473266, 61379113) and Postdoctoral Science Foundation of China (2014M552013) and the Scientific and Technological Project of Henan Province (132102210521).